For other things named Burlington, see Burlington (disambiguation). "Oldest City In Ward County"
Burlington is a city in Ward County, North Dakota, United States. It was founded in 1883, the third in a series that included two earlier settlements. Despite this, Burlington is still the oldest city in Ward County, as well as north-western and north central North Dakota. In 1885, as it was the only city in the then-newly formed Imperial Ward County (now split into Ward, Renville, Mountrail, and Burke counties), it was made the county seat, a position it held until 1888. The population was 1,060 at the 2010 census. Burlington is part of the Minot Micropolitan Statistical Area. Cartograph circa 1886, showing Burlington as the largest settlement in NW Dakota Territory. 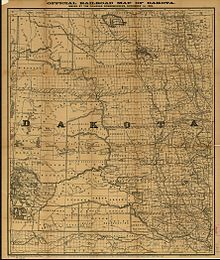 Burlington and its former settlements were founded by James Johnson and James Colton (the men who also settled Larimore, North Dakota) in Dakota Territory in the late 1870s. Earlier settlements were The Forks, and later Colton (named after James Colton), which are considered forerunners of the city. Its current name was given to it by James Johnson during the creation of the post office, and was the name of his hometown of Burlington, Iowa. "The Forks" was used as a name for Burlington, alluding to its geographic location at the confluence of the Des Lacs and Mouse Rivers. In the early 1890s, the Burlington Reporter became the first newspaper in western North Dakota. It would in the future be renamed to the Minot Daily News. In 1997, Raymond Kuntz from Burlington testified to in front of the United States Senate that he believed his son, Richard, committed suicide due to the influence of the band Marilyn Manson. On January 18, 2002, a severe train derailment east of the city sent a gigantic cloud of anhydrous ammonia toward Minot and Burlington. Power was knocked out to the residents of Burlington for many hours due to damage to power lines. Residents were unable to access radios or televisions due to this, although messages went out advising people to stay inside. One man died and many of the area's citizens were sickened by the noxious gas. The incident was one of the more major chemical spills in the country. In early 2006, court cases were heard in Minneapolis, Minnesota, against Canadian Pacific Railway, the owner and operator of the derailed train. The anhydrous ammonia spill was the largest such spill in U.S. history. This incident was used by Eric Klinenberg in his book Fighting for Air: The Battle to Control America's Media as an example of the failure of mass-media, specifically local radio stations, to disseminate information to the public in an emergency. Burlington is located on the Drift Prairie of north central North Dakota at 48°16′39″N 101°25′40″W﻿ / ﻿48.277475°N 101.427694°W﻿ / 48.277475; -101.427694 (48.277475, −101.427694), directly next to the confluence of the Des Lacs and the Mouse Rivers, in Burlington Township, North Dakota, and Kirkelie Township, North Dakota. According to the United States Census Bureau, the city has a total area of 0.64 square miles (1.66 km2), all of it land. This climatic region is typified by large seasonal temperature differences, with warm to hot (and often humid) summers and cold (sometimes severely cold) winters. According to the Köppen Climate Classification system, Burlington has a humid continental climate, abbreviated "Dfb" on climate maps. As of the census of 2010, there were 1,060 people, 399 households, and 293 families residing in the city. The population density was 1,656.3 inhabitants per square mile (639.5/km2). There were 410 housing units at an average density of 640.6 per square mile (247.3/km2). The racial makeup of the city was 94.2% White, 0.1% African American, 2.7% Native American, 0.2% Asian, 0.8% from other races, and 2.1% from two or more races. Hispanic or Latino of any race were 2.1% of the population. There were 399 households of which 40.4% had children under the age of 18 living with them, 57.9% were married couples living together, 10.3% had a female householder with no husband present, 5.3% had a male householder with no wife present, and 26.6% were non-families. 21.6% of all households were made up of individuals and 8.3% had someone living alone who was 65 years of age or older. The average household size was 2.66 and the average family size was 3.11. The median age in the city was 33 years. 28.8% of residents were under the age of 18; 8.3% were between the ages of 18 and 24; 27.4% were from 25 to 44; 27.6% were from 45 to 64; and 7.8% were 65 years of age or older. The gender makeup of the city was 49.2% male and 50.8% female. As of the census of 2000, there were 1,096 people, 369 households, and 298 families residing in the city. The population density was 1,737.5 people per square mile (671.7/km2). There were 388 housing units at an average density of 615.1 per square mile (237.8/km2). The racial makeup of the city was 96.08% White, 0.55% African American, 2.01% Native American, 0.18% Asian, and 1.19% from two or more races. Hispanic or Latino of any race were 0.91% of the population. The top 6 ancestry groups in the city are German (48.8%), Norwegian (32.3%), Irish (7.5%), Swedish (4.9%), English (4.7%), French (3.6%). There were 369 households out of which 51.8% had children under the age of 18 living with them, 65.6% were married couples living together, 11.7% had a female householder with no husband present, and 19.2% were non-families. 14.6% of all households were made up of individuals and 4.3% had someone living alone who was 65 years of age or older. The average household size was 2.97 and the average family size was 3.27. In the city, the population was spread out with 35.9% under the age of 18, 7.4% from 18 to 24, 33.7% from 25 to 44, 16.9% from 45 to 64, and 6.2% who were 65 years of age or older. The median age was 31 years. For every 100 females, there were 93.6 males. For every 100 females age 18 and over, there were 93.7 males. The median income for a household in the city was $40,078, and the median income for a family was $42,639. Males had a median income of $24,922 versus $19,179 for females. The per capita income for the city was $14,250. About 2.7% of families and 3.7% of the population were below the poverty line, including 3.0% of those under age 18 and 9.4% of those age 65 or over. Burlington's school district merged with Des Lacs' school district in the late 1960s to form United Public School District 7, thus Des Lacs-Burlington High School now serves students living in Burlington. This means that it has since shared a school system with nearby Des Lacs. Children in grades kindergarten through eighth attend school in Burlington, while those in grades nine through twelve attend high school in Des Lacs. Before 2000, there was a lack of room for the possibility of the seventh and eighth grades being located in Burlington, as the room needed for those grades was not completed until that year in the form of a new junior high wing. Burlington-Des Lacs Elementary School had approximately 500 enrolled students as of the 2008 school year. The railroads remain in Burlington today, and are becoming more important to the local oil and gravel industries, though Great Northern is now part of the BNSF Railway and the Soo Line is run by the Canadian Pacific Railway. There are three private airstrips and landing strips within a three-mile radius of Burlington. One, Pietschtree airstrip, is located directly next to Burlington to the north. Otherwise, major aerial transportation is through Minot International Airport. One of the first buildings in Burlington was the first Ward County Courthouse, built by James Johnson, and was used originally as a granary. It was moved to the North Dakota State Fair fairgrounds in the mid-20th century and served as one of the three buildings of the Ward County Historical Society's Pioneer Village Museum. In 2019, the Ward County Historical Society announced that the building was to be moved back to Burlington along with the entirety of Pioneer Village Museum due to legal issues with the State Fair Association. The other two buildings, the Immanuel Lutheran Church and the Sundre Log Cabin, will also be moved. ^ Stout, David (1997-11-07). "A Hearing Focuses on Lyrics Laced With Violence and Death". The New York Times. Retrieved 2019-01-19. ^ Kahn, Carrie. "Two Towns, Same Flooded River, Different Fates". NPR.org. Retrieved 2019-01-19. ^ "Population Estimates". United States Census Bureau. Archived from the original on October 19, 2016. Retrieved June 9, 2016. ^ a b Johnson, Andrea. "Museum has to go by June 15". Retrieved 2019-01-19. This page was last edited on 9 April 2019, at 20:27 (UTC).